ONE writer reminds that there’s nothing permanent in this world except change. Some of us have the notion that life would be better if the people around us or our loved one would change in their behaviour as we want them to be. But this line of thinking would be too much of an asking, especially if the person concern refuses to change. Our attitude spells a lot of difference when we know how to adjust ourselves and accept people what they are not what we want them to be. This kind of gift not only makes life easier and harmonious but it can also be great help when scenarios in life change. Lilian Too believes that accepting change in any form, makes coping easier. She comments: “Change can creep up on you like a stealthy stranger in the night, or it can descend suddenly in a shower of midnight snow, transforming the scenery outside your bedroom window when you wake up in the morning. Change can reveal itself in slow motion or drop at your feet with aloud thud. Change can be painful. Look forward to change and accept whatever it brings, no matter what form it takes. 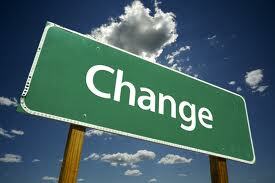 Change is inevitable; acceptance of it makes change a lot easier to cope with.